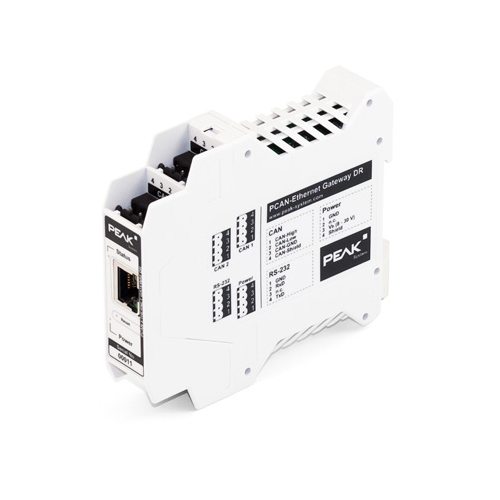 The PCAN-Ethernet Gateway DR allows the connection of different CAN busses over IP networks. CAN frames are wrapped in TCP or UDP message packets and then forwarded via the IP net from one device to another. The PCAN-Ethernet Gateway DR provides one LAN connection and two High-speed CAN interfaces. With its DIN rail casing and the support of the extended temperature range, the module is suitable for use in an industrial environment. The configuration of the device is done via a comfortable web interface. Besides a variety of status information, settings for the device itself, for the communication interfaces, and for message routing are provided.